Preheat oven to 350°F. Butter a 9-inch springform pan and line bottom with parchment paper. Bring about 2-inches of water to a simmer in the bottom half of a double boiler or in a medium saucepan. Place the top half of the double boiler, or a metal bowl or heatproof pan if not using a double boiler, over the simmering water and melt together the chocolate and the 1/4 cup butter. Set aside to cool. Using a blender, chop the pecans finely. Add the eggs, vanilla, sugar, salt and melted chocolate mixture, blending until smooth. Pour the batter into the buttered springform pan and bake until a toothpick inserted in center comes out moist but not wet, about 40 minutes. Once it has cooled a little, run the tip of a knife around the pan and release the cake from the pan. Invert onto a plate, and then again, or serve directly onto plates if left on bottom part of springform pan. If desired, sprinkle with confectioners’ sugar and serve with whipped cream and berries. Have a great Easter, Laura! I’ve been making this cake for a decade. It’s so genius and easy, it’s literally foolproof. I only make it on Passover and now the family is so excited to eat it each year. I’m honored that the cake is part of your Passover tradition! I honestly cannot wait to try this recipe!! Nos encanta. Lo he servido varias veces a mi familia y siempre es delicioso. Gracias por la receta. Wonderful quick and easy dessert but next time I’ll use the food processor. Hard to get batter out of the blender. So glad you enjoyed the cake, Jennifer! Oh thank you so much, Denisse! One our families favorite!!! Easy to get all five kids involved as well!! Thank you for sharing!! Oh thank you Bullock Family! I hope you have lots more fun kitchen adventures together! Would it be good for a diabetic? I made it before with only 1/4 cup of sugar. Just as good. Thanks for the recipe. We all love watching your show. You have such a bubbly personality and it is catching! Thanks! Thank you for tuning in, Johanna. You can always adapt my recipes to meet your dietary needs. Please make more flourless recipe . for Sunday supper this weekend. Recipe and inspiration to my meals. I made this yesterday for the Jewish holiday of Passover and brought it to our seder dinner – we aren’t supposed to eat bread. It was a big hit with everyone. Thanks for sharing your family recipe. Thank YOU Brian. I hope you have a Happy Passover. My 14 yo son and I watch your program and had to try this recipe. It was so easy to create and a breeze to clean up too. We baked and sculpted a Chocolate Ribbon Cake from Julia Child and that cake took me 11hours. Albeit was delicious the ease of this recipe has won me over. I will make it for brunch this weekend! Oh I hope you and your son had fun in the kitchen! Hi Pati, love your show. I am married to a Mexican but I am not. Mexican food has always been my favorite food. When I was a little girl I would always choose tacos for my birthday dinner. My mom was an excellent southern cook & would kind of cringe when I requested them. She was a good sport though & would fry corn tortillas until I got my fill. I usually ate about 6 as I had a very hearty appetite! Plus more for my dad, sister & herself. They were just ground beef tacos but they were delicious! In my 40 years of marriage I have made many different Mexican dishes, including tacos, of course! Your show has inspired me to try even more different types of meals. I really want to make this cake, but was wondering if it has to be baked in a springform pan? Thanks Pati. P.S. I love when you cook with your son’s. I have 2 boys & they both are really good cooks. My younger son is a vegetarian & he is very creative in the kitchen. Thank you for sharing your story, Debbie! It sounds like you have lots of fun in the kitchen. For this cake, you can use another 9-inch pan and wax paper too. Oh wow! Your favorites category…so happy to hear that Carol. Now I understand why your husband wanted to eat the whole cake 😀 So easy to make yet so delicious!!! Hahaha…so glad you liked it Kurt! I am gluten free and this cake is delicious with low sugar cream cheese frosting! Hi Patti, I am a huge fan of yours. I love ur style of cooking. Can you please tell me the substitute for Egg in this recipe?? I am a vegetarian from India. Thanks in advance. Looking forward for your reply. I can’t wait to make this one. It always makes me sad when the gluten-free people in the extended family (especially kids) get left out of the holiday dessert table, so this seems like something EVERYONE can share and nobody will feel excluded! I made this today and it is amazing! Sprinkled it with powdered sugar and put a few raspberries on top! My husband is gluten free and there aren’t many desserts he can eat but he loved this one! Great and simple recipe! So glad to hear that your husband (and you) enjoyed it! Pati, what more can I say other than …Thank you, thank you, thank you and you are such a wonderful person! I just love your show, I watch it on PBS every day! You are my favorite chef and have been such an inspiration to my cooking. I have learned so much about Mexico, the different foods and so many amazing ingredients from watching your show! All i wanted for Christmas were your cookbooks and a comal. Although I didn’t get the books, I finally have my comal, which is obviously so very vital to many of your recipes. Tonight, for new years eve I am baking this gorgeous cake. It is my second desert recipe of yours that I am trying. The first was the almond leche cake, which was absolutely delicious, the best chocolate cake I have ever had by far! This one seems really similar, so I am seeing which one I like best…Oh and my almond cake came out super moist, just like you said, and had the high edges and a sunken middle, which most people don’t realize is normal for these types of cakes, so to make mine just as pretty as the picture i took a super sharp knife and cut off the high edges around the whole thing to make it even with the center, then sprinkled my powdered sugar. Hopefully this one will be as great, wish me luck! Happy New years Path to you and your family!!! Good luck Jessaleah! And thank you for your lovely comment! I hope you have lots of fun with your new comal. Just as i thought, this cake was just as delicious…super moist and so flavorful! Im torn between the almond leche cake and this one, but just as your hubby loves this one, my fiancé loves this one best too! Thank you Pati and of course Nana José too! Made my New Year’s even better. Hola Patti – Love the cake! It was easy to make and gluten free as well. A winner in my book. We will be making this cake for the Jewish holiday of Passover as there is no leavening in it. Thank you and have a great New year. This is so easy, it becomes a hazard to my health! Why, because you can make it so quickly. Love it! Hahaha….well I’m glad you love it! Thank you. This is so good and perfect for those who can’t have gluten. If you use Splenda instead of sugar, it’s even low-carb. Fantastic!!!! Thank you, so much. Hi Pati, Just made this today and it was lovely. I love your show, it’s very very good. I hope you will have more gluten free recipes in the future. Not many chef will do that. ​Hola! Yes you can use another 9-inch pan and wax paper too. I love Ropa Vieja too! Do the pecans have to be toasted first or do you just use them from the bag? Straight from the bag :). I made this cake this afternoon. Really easy, and REALLY good. I have, however, converted ALL my recipes to metric. All the dry ingredients in one bowl and all the liquid in another. Weighing in grams is much easier and more accurate. I can remember trying to dig all the shortening out of a measuring cup, but never again. For instance, this recipe calls for 1/4 cup butter which translates into 57 grams. 6 ounces of chocolates converts to 70 grams. I put a pyrex glass bowl on the scale, add the chocolate, zero the scale and weigh the butter, put the bowl over simmering water and stir the 2 together. The pecans and sugar are easily measured, but I still weigh the sugar for accuracy. I have a chart of all my ingredients for baking and can whip up a cake or cookies in a flash. I guess that, because I taught the metric system to intermediate school children, and later worked as an industrial chemist, I am more comfortable with that system. They still call it the British system of weights and measures, but they use metric in the U.K. Hmmm, makes one wonder. I seriously suggest you try it, you just might be a convert – and DO try this cake. That’s wonderful that you are so precise Dr. Jim, and I’m glad you enjoy the cake! Is it preferable to refrigerate or keep this cake at room temperature one day before serving it? I bring it to room temperature when serving it. Hola Julia! You are always welcome to adapt my recipes to your taste and needs! I loved the cake. It was simple to make and tasted so good. Can you replace the butter with coconut oil. Will this cake freeze well? If so, when it is time to serve it, should I set it out to room temperature or heat it up in the oven? Yes! The cake freezes beautifully Katy. When you are ready to east it just bring it to room temperature before eating. I just made this cake for my Mom (for Mother’s Day). We doubled the batch and it had to cook longer. Next time I’ll do 1 batch instead. It tasted great. Thank you for sharing the recipe. I really enjoy watching your show on PBS. Thank YOU for trying the recipe Dee! We are huge fans of the show! Wish it was available on DVD. We have made this several times and it was always delicious, but tried it with cocoa powder last time and it separated while cooking. Is there a successful way to make it with cocoa powder? Thanks so much! I made this wonderful cake for my husband for Valentine’s day too. Le encanto! Quiere otro! Gracias Paty you are the best!? Saludos desde el Valle Central, California! Yum I me for valentine’s! Baked in a heart shaped pan. Thank you Patti! I’m married to a Mexican and he loves when I cook things from Mexico. A heart shaped pan…what a sweet idea. I hope your husband loved it Rene. Hi Pati! I made this flourless cake this afternoon, adding pistachios as the nuts, and it turned out so moist and delicious! Thank you for sharing your husbands favorite cake from his Nana Jose! My cake did come out with hills and valleys….I came out with a rather perfect light chocolate crust dome. Then “sank” perfectly into a nice flat cake. It didn’t have that nice dark color. So, is it because I used bittersweet morsels, rather the expensive block chocolate? I’m sorry that I didn’t pay attention, as I was listening rather than watching you. What did I miss? Thank you for this recipe!!!! It reminds me of my grandama’s whacky cake. That one uses flour, but no eggs!!! Your grandma’s whacky cake sounds so interesting! I am out of pecans….do you think almonds would be a good substitute? LOVE your show on PBS & your website, thanks! Hi Pati! My kids and I love your show! (My daughter loves your accent and the way you say salsa!) I made this cake today and it didnt come out flat..at all. One edge raised up like a big wave and the rest is all hills and valleys. Do you know what could have caused this? My batter was a bit stiff before baking, not sure if thats normal or not. It didnt want to simply pour out of the blender. Maybe I over blended? Anyway, thanks for any help you might be able to give! Cant wait to try some more of your delicious recipes! I do not at this time but will look into it! I’m happy you like the cake! Hi Pati,my kids are dairy free. Would I be able to use a vegan margarine instead of butter? Came out yummy. My husband want 3 of them next time since we have 3 spring form pans. 🙂 I made one change-I couldn’t find bitter sweet so I used semi-sweet and then only added half the sugar. It seemed to be fine but will try bitter sweet in the future when I have more time to get to a traditional grocer. I do have one questions Pecans are pretty pricey-have you ever tried it with walnuts or other nuts? Yes!! It’s great with other nuts! This cake is soooo good! Being gluten free I was anxious to try it. If you love chocolate this is the cake for you! I’m thrilled you liked it David!! I am such a big fan! Love, love, love your show. While I’ve enjoyed many chefs’ teachings over the years, your cooking I would eat every day! Your recipes are so much more than ingredients…they are treasured family stories and/or history lessons. I appreciate the complexity of flavors you bring to every dish. I cannot eat peppers but even when you have them as an ingredient, the dish has so many flavor layers, the peppers are never missed. This cake is perfection, especially for my gluten free family members. Thank you for sharing so much! I first made this cake in July 2015 for my mother in law for what turned out to be her last birthday. She loved it! On December 29th I served it again in her honor at a gathering we had after her Memorial Mass. All the generations loved it! Hi Patti,hope you and your family have a peaceful holiday.I enjoy your program so much. It’s just wonderful! The recipe is the perfect answer to a diabetic’s sweet tooth! Since the carbs from flour wasn’t there, my reading was much lower than when I’d have regular cake. I used a Ninja, but I think that was a mistake. It was harder to clean the blades to get the yummy batter. Will use my Cuisinart next time. I will also send this to my friend who has celiac disease. I think it’ll be okay. I looove your show. Hola Annie, Thank you so much! Good to know it works for diabetics. And, yes, you can recommend it to your friend; it is gluten free! Patti, love your show and the simple down home recipes with easily found ingredients! As my hubby and I both love seafood and fish your recipes today will be my menu this coming weekend. We are 60 and 64 respectively and as you get older the taste buds go on the fritz so mexican recipes are a staple at our house. Your recipes have been a wonderful addition! Hope to see you cooking for many years to come and love your travels too! By the way what were the little fish you were shown fishing for today? Those tiny little fish are called charales. They are the white fish or “pescado blanco” from Patzcuaro, but when they are very tiny. Thanks for watching my show! 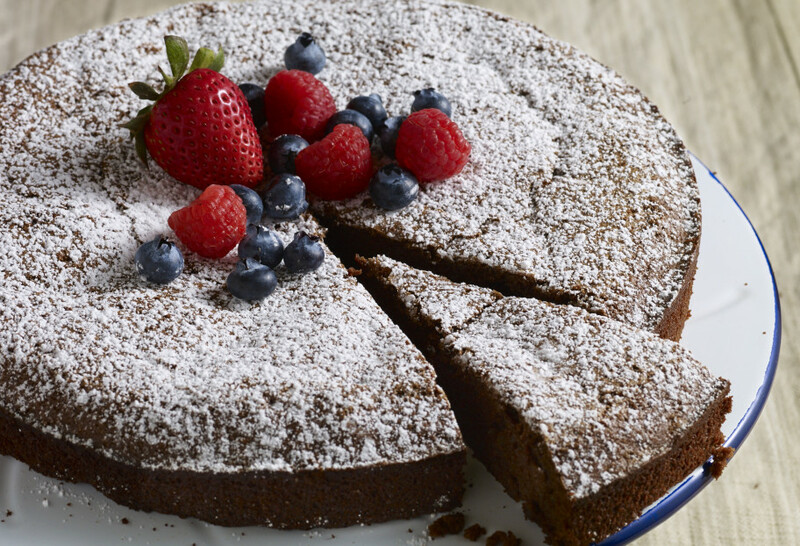 could you use sucanat or brown rice syrup instead of white sugar in this cake recipe & same amount? I made this cake today to celebrate my mother -in-laws 82nd birthday. Mary Louise Meraz Olivares loved it! Neither she nor anyone else could believe there was no flour in the cake . This is a fantastic recipe. Thank you! Muchas gracias, Adriana! Voy a tratar de publicarlas también en español. Hi, Patti. I love your show so much. I gotta try this cake, could I use a 9inch glass brownie pan instead of springform pan? Yes, you can use a 9-inch brownie pan instead! Thank you for watching the show!! Have you tried adding cinnamon to this? Have you ever made this with cinnamon for more of a “Mexican chocolate” taste? I haven’t, but sounds great! Go for it!! This cake looks wonderful. I can’t wait to try it. My family and I love watching your show. My daughter (19) has been inspired to try cooking because you make it look so fun and easy. ¡Gracias! Thank you!! I hope your daughter makes you many amazing meals! Thank you so much. I put a doily on top and dust with powdered sugar. Absolutely the best cake ever. Thank you for making it, Cathy! This is always my go to cake, with a toddler always at my feet it so easy to throw together. It’s very rich and decadent, I always have to make two if I’m taking it to a party (one for home of course)! I’m not big on pecans so I always sub hazelnuts, turns out perfect every time! Thank you! Hm: Hazelnuts sounds even better! Hello! Would like to try this recipe at Christmas with roasted chestnuts, but unsure how to measure them. Would doing a rough chop before measuring give an accurate measurement? Also, this may seem weird, but would you please consider being a voice/reader for an audio book? Your voice is so sweet & soothing! Hola Lori, Yes, a rough chop would work for measuring 1 cup of the chestnuts! I’m laughing so hard over the voice for an audio book! Thank you for your comments!! I LOVE your show on Create! Could this cake be made with pistachios? Thanks for your contagious love of food and your presentation of so many delicious recipes from Mexico! Thank you for watching, Tapi! Yes, you may try the flourless chocolate cake with pistachios. Let me know how it turns out! Love this recipe!! I have made it 3 different times. Once I made 2 for a large family gathering. It was a huge hit, not even crumbs left! Told everyone it was your recipe. My family and I love your show. My hubby and I sit down with the 4 kiddos and watch. You make us sooooo hungry! Thank you for the good food and family time! Blessings, hugs and Besos! I’ve tried a few of your recipes and loved them. I’m trying this one the flour less cake today. I just one question. Do we need to toast the pecans? Thank you! Hi Adrian, So happy to hear you are trying some of my recipes! No need to toast the pecans for the cake. I saw your show this past weekend, and the flourless cake recipe was easy to make. hi how ever adapted it to a sugarless recipe using Splenda as I follow a low carb diet. it came out wonderful such great rich taste and so decadent. thank you, pati. Hola Joanna, Great idea to try it sugarless! Thank you for sharing!! Pati, my wife was recently diagnosed with a gluten intolerance and we saw you making this recipe on TV and were overjoyed that it did not call for any flour. We made it last night and it was wonderful! Now my wife can add another dessert to her choices of gluten free foods. Hope you continue to make gluten free foods in future shows. Thanks! Hola Paty: A mi esposo y a mí nos encanta tu programa, yo soy Mexicana y él es Americano, pero a los dos nos encanta la comida!! Amo tus recetas y tu acento al hablar inglés yo hablo igual jajaja. Voy a comprar tu libro , me encanta que México tenga una imagen tan bonita y positiva como lo representa tu persona. Un gran abrazo y felicidades !! This is the fourth recipe I’ve tried from your show… I made it today because my husband and I had some friends over. I topped it with the confectioners’ sugar… Another instant hit!! I love that your recipes are not hard to follow, and they taste amazing!! I love love LOVE your show!! I am so happy you are trying more of my recipes! Hi Pati, just made this for my family. It comes together so quickly and tastes great! I topped it with whipped cream and raspberries. For next time, I’m thinking almonds and orange . . . the possibilities are endless! Hola Jen, So happy your family enjoyed the cake! Sounds delicious with almonds and orange…go for it! has anyone tried it with coconut flour? A really great and simple recipe. I’ve made it about 3 times so far. Each time was a bit different. The first time I stuck to the recipe exactly and it came out fantastic. Then for the other two I used Coconut oil rather than Butter (Works almost as well since both are solid at cooler temperatures although Coconut oil does begin to melt sooner than butter) and substituted Almonds for the Pecans (Although Pecans are a natural mix with the cocoa since they have a dark Maple type of flavor). Basically you can play endlessly. I should also note that I use Dutch Processed Baking Cocoa Powder. Works really well. I may be putting too much since it is pure Cocoa Powder and this makes the cake a bit more bitter and less sweet but this is desired by my wife and I. Thank you for the recipe Pati. I look forward to all of your other recipes. Hi Sidney, Great that you are experimenting with this recipe! Thank you for sharing!! Just wondering, how do you happen to be in DC? So glad for your show. Thank you, Virginia! I hope you try the cake sometime. I moved to DC many years ago with my husband and oldest son. Thank you, Rose!! So happy your family liked the chocoflan; let me know how the cake turns out! Looks delicious!! I will do this recipe instead of the cake from the box, can’t wait to surprise the hubby. Thanks again for the wonderful Mexican recipes you showcase on your show. Gracias por la presentacion!! Felicidades!! Muchas gracias, Jackie! I am pretty sure you will love this cake… we LOVE it at home! Delicioso!!!!! Me pregunto si podría hacerlo sin chocolate para que solo fuera de nuez, añadiendo un poco mas de nuez, qué opinas? Saw your show the other day. Tried your receipt and agree it couldn’t be simpler or more delicious. Thanks ! as a fan of yours and your show since the beginning, i must tell you how much i’m enjoying season 3! .. luv seeing your sons and hubby – and your visits to mexico, your family there (esp papa 😉 .. you enlighten me about all the choices i have at good mexican restaurants .. and your simpler recipes inspire me to do mexican at home more often. i’m not a confident baker so this easy dessert goes into my MAKE SOON file .. This looks really good to me too! I have a child with a nut allergy. I’m gonna try using sunflower seeds, instead. It just might work. I’ve made sunbutter cookies, and they taste pretty good. So maybe that substitution will work. Hi! How did the sunflower seeds work? Raw or roasted? Thinking about using pumpkin seeds, chestnuts at Christmas. You are so sweet and cheerful, it is wonderful to see your enthusiasm for life. I am making this cake soon. Thank you so much! Thanks Patricia! I hope you like it… my husband LOVES it. Thank you for this easy and reliable recipe. We can’t eat grain and we missed having a luxurious treat. This cake fills every craving. I added a little extra cocoa powder and this gives it a more cake-like consistency. Everyone should try this recipe at least once (but it will probably become a staple). Gracias, Pati….me encanta tu programa! Made this today and it is absolutely delicious! This will become a staple in my house, great recipe. Try it, you won’t regret it. Patti, this cake is a winner. I made it tonight and my husband asked for seconds. Thank you for sharing! Well, my husband finishes right in front of me if I don’t take it away… Glad it works for yours too! As the (middle-aged) child of an excellent cook who loves to experiment, I was raised on international cuisine. The ingredients for this cake are so similar to the classic French flourless chocolate cake – but it’s simplicity make it very Impossible Pie-like. I am hoping it will become a family favorite for my own foodies. Thanks for the passion you bring to your show and to sharing with us the joy you bring to your family table. It is so evident in your show. really; I found the flourless, chocolate cake. have to try this and the pacifica shrimp cocktail… can’t wait till the weekend to get my ingredients! I wish Patty would make this cake without butter. Maybe she could revise this recipe, and use apple sauce, or pears, or…..something so the cake would be reduced fat. Robert: you should play with it and let me know how you like it! I used Stevia instead of the sugar, as you suggested and my friend really enjoyed it. I truly love watching your shows. I love how you are so proud of being Mexican and you enlighten your view of the beauty of Mexico and wonderful qualities!!! Thanks you again for being you! Thank you so much, Perla, for tuning in. You are so kind to leave me this lovely message! can this be made for a diabetic? Hola Sharon, You may try it with the sugar substitute of your choice instead of using sugar. However, I would only use half amount or less of sugar substitute, since sugar substitutes tend to be much sweeter than sugar. I love you show, especially all the footage from your travels…. Esta increible el pastel y muy facil. Me encantan todas tus recetas; tengo tu libro. Las medidas siempre estan correctas y todas las recetas estan deliciosas. Que bueno que te gustan! Espero que pruebes muchas más! I made this on Friday and all I can say is:”thank you Nana Jose!” This is so delicious that every time you walk through the kitchen you want a little pinch of that cake. I really think it improves over the next day. Also, this is the easiest cake I have ever made. Loved this show. I made the Coctel de Camarones and it was delicioso. Tonight I am trying the flourless chocolate cake. It sounds wonderful! Thank you for watching, Judi!! So happy to hear you are trying recipes. Question – Do you serve this hot, right out of the oven, or does it need to be totally cooled? You can serve it hot, warm or cold! Doesn’t need to be totally cooled at all. My husband who happens to be from mexico city loves this cake, but says to him it tastes more like a brownie. Is it suppose to taste like a brownie did I do something wrong? It does taste a bit like brownie, Samantha!! My husband who happens to be from mexico city loves this cake, but says to him it tastes more like a brownie. Is it suppose to taste like a browniebor did I do something wrong? Love this recipe. Saw you on Create TV last weekend. I have made it 3 times all ready. Family loves it. It is so easy. We have pecan trees and we raise chickens so we have lots of eggs. Perfect recipe. Can I substitute almonds for the pecans and still expect good results? My wife hates “oily” nuts like walnuts and pecans. But she will eat almonds. I am hooked on Pati’s show and cannot wait until the next episode. I was the star of our Sunday family dinner thanks to Nana Jose’s Flourless Chocolate Pecan Cake. I’m not telling my family how ridiculously easy this was to make. Patti – best and easiest cake I have ever made. Can you please modify recipe if using a 10-1/4″ spring form pan instead? Or your best judgement. I’d just remove it form the oven 5 to 6 minutes before: give it a try! Thanks Pati, but I ruined it a bit; went 10 over and did not use bittersweet, but organic without any sugar in it, chocolate;, adding a bit more sugar to compensate. Was too dry; my fault. Was so simple and yet my thoughts were elsewhere.. Will try another time. baking is chemistry, you just can’t change the formula and expect the results to replicate the original recipe, people do this all the time and report a bad results. nana jose has a gem of a cake here! truly simple to make. used extra bitter chocolate. so delicious! thank you!